General Home with Structural Pest Inspection: This report shows good use of the header and footer (paragraphs at top and bottom of the report), effective use of ReportHost's pre-written Limitations and Concerns, and the "Limitations" language for each section of the report. Residential home: This inspector customizes his comments to provide his client with lots of additional information. Residential home: This inspector includes good quality photos with arrows/circles, has informative headers and footers, and good quality company logo. Office building, light industrial: This inspector displays concern types as text rather than icons, and mainly uses his own concern texts rather than ReportHost's default texts. 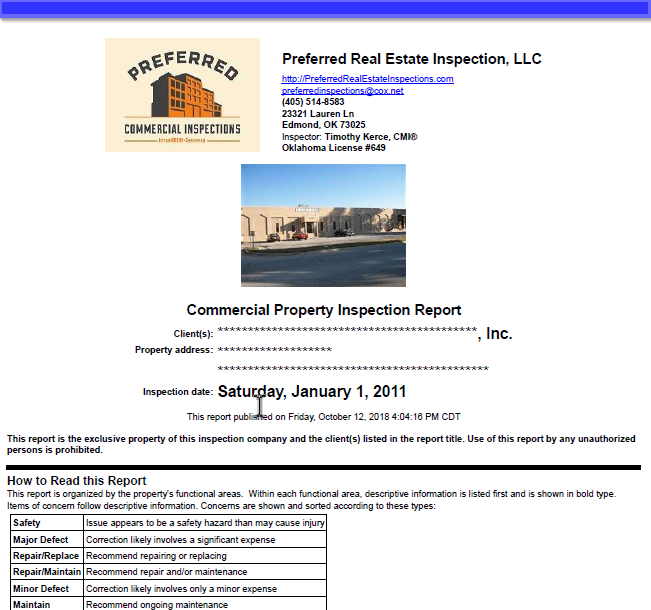 Office, warehouse, light industrial: This inspector includes photos from an infrared camera and includes his signature and ASHI logo in his report footer.